The City of Chicago will kick off summer programming along the Chicago Riverwalk during a day-long celebration on Saturday, May 20, 9 a.m. – 9 p.m. The celebration offers a preview of the summer programming that will be offered along the riverfront through October. Activities include walking tours led by the Chicago Architecture Foundation, parades with puppets and Fishing at the Jetty led by the Chicago Park District—plus the “Dance of the Bridges,” a traveling music cruise and a pyrotechnic display. 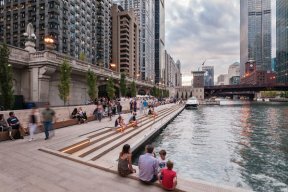 Mayor Rahm Emanuel and DCASE have designated 2017 the Year of Public Art, and the Riverwalk offers a new and improved way to enjoy Chicago’s own unique waterfronts and architecture as the backdrop for summer. 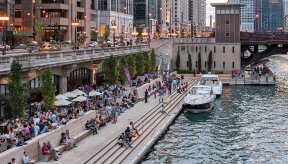 Completed in the fall of 2016, the Chicago Riverwalk (Lake Shore Dr. to Lake St.) is a 1.25-mile promenade through the heart of the city and a summertime destination for Chicagoans and visitors alike. The Chicago Riverwalk Summer Kick-Off Celebration is presented by the City of Chicago and produced by the Chicago Department of Cultural Affairs and Special Events in collaboration with the Chicago Department of Fleet and Facility Management, Choose Chicago, the Chicago Park District and the vendors and boat tour operators along the Riverwalk. All events are free unless otherwise noted. For more information about the Chicago Riverwalk and a complete schedule of events, visit chicagoriverwalk.us—and join the conversation on social media using #ChiRiverwalk.